Oasis 2800 Deck and Patio Shades were invented in 1986 for Patio Sun Protection. Our shades will dramatically reduce sun glare and keep you cool to enjoy the great outdoors. Shades provide protection from errant golf balls and a level of privacy from nearby neighbors. Making your patio area safe and private is what our Oasis® brand is all about. Dense solar screen fabric weaves provide excellent daytime privacy. Light colors screens provide the best privacy. Oasis Patio Shades are ideal for multi family applicationsOasis® 2800 Solar Screen Shades are engineered to accommodate large patio openings up to 19′ wide by 14′ tall. We can accommodate small openings as narrow as 31 3/8″ with a motorized shade. All Oasis 2800 shades are custom-made with a choice of side track or cable guide systems to provide greater stability in a light breeze. These solar screen patio shades include a fully enclosed 5″ x 5 1/2″ extruded aluminum headbox for greater product protection when retracted. Shades are available with hand crank or motorized operation. Hand crank and gear operation of a patio shade is made easy by dual grips at the end of the handle. When not in use, the handle is removable. Manual crank operated shades are available up to 16′ wide and heights up to 10′. 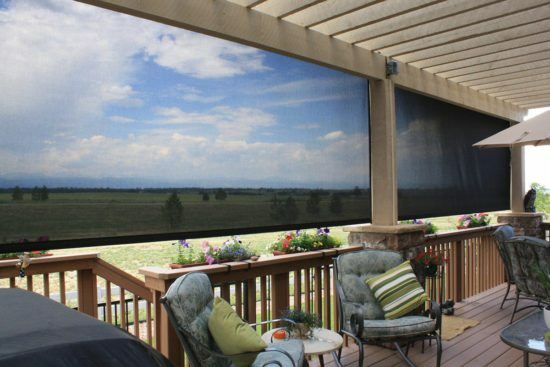 Operate your patio sun shades with the touch of a button! Insolroll Quiet Motor Technology (IQM).-Shades are available with 2 Somfy motor types: 110V AC quiet motors or 110V AC radio quiet motors. Radio motors are the most common choice choice and make retrofit applications easy as the switching is all wireless. Shades can be controlled by Somfy wireless wall switch, hand-held remote control, or even smart phones. Our 5-sided headbox both stores and protects your fabric, as well as conceals the roller. Our system has been upgraded for 2016 with a heavy-duty extruded aluminum headbox and stronger mounting brackets that now allow us to expand maximum shade width to 19′ in a single shade. For new construction patio applications, a hidden shade with a “built-in” appearance may be desired. Click on the next tab to learn more about our Exposed Bracket/Pocket option. All fabric edges on the Oasis 2800 Patio Shade are welded, or heat sealed to prevent unsightly fraying of the edges. At the bottom edge, a metal hem bar is inserted in a welded pocket. The two side edges of the fabric are secured by your choice of a cable guide system or a track guide system. Insolroll offers an exposed bracket system for building patio shades into site-built pockets. Aluminum brackets are mounted into pocket prior to shade being installed. The brackets can be attached to ceiling or wall. Shown here with cable guide system. Several installation scenarios in site-built pocket with exposed bracketOasis 2800 Shades can be ceiling mounted or surface mounted inside a cavity above the ceiling, or site-built pocket.